nj arts maven: CRITICS LOVE TWO RIVER’S “MERRY WIVES OF WINDSOR”! 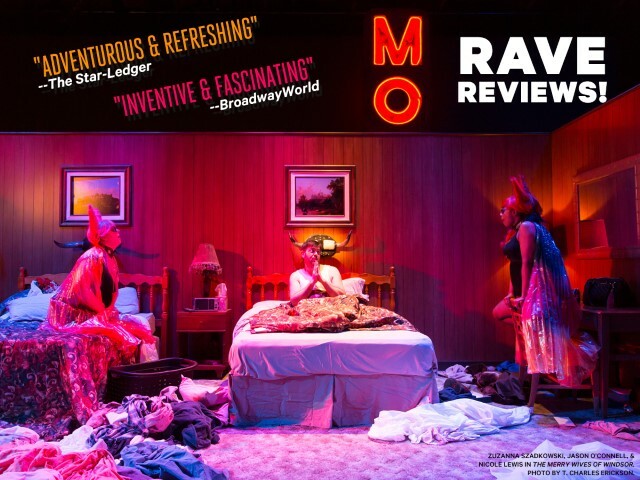 CRITICS LOVE TWO RIVER’S “MERRY WIVES OF WINDSOR”! Featuring only three actors—Nicole Lewis, Jason O’Connell, and Zuzanna Szadkowski—this production of The Merry Wives of Windsor explores the darker undercurrent of one of Shakespeare’s silliest comedies. In the play, the lecherous buffoon John Falstaff decides to seduce both Mistress Page and Mistress Ford, respectable married women of Windsor. When the two women immediately see through Falstaff’s plot, they decide to turn the tables on him and devise a plot of their own. Please note: this production contains adult content and sexual situations. The production will run approximately 100 minutes, no intermission. Conveniently located across the street from our theater in the Galleria, Siam Garden is a fantastic choice for pre- or post-show lunch and dinner. Featuring “world renowned Thai cuisine in its best, most diverse, and authentic form,” Siam Garden’s menu includes a wide selection of traditional and Thai cuisine appetizers and entrees including specialty sauces and a vegetarian menu. Your food experience is heightened by the beautiful authentic decor made up of hand-picked antiques, woodcarvings, Thai silks and original paintings imported from Thailand. Siam Garden has been in business for 15+ years and celebrates success as one of Monmouth County’s premiere Thai food restaurants — and has been a favorite for Two River staff and artists! Click here for a menu.